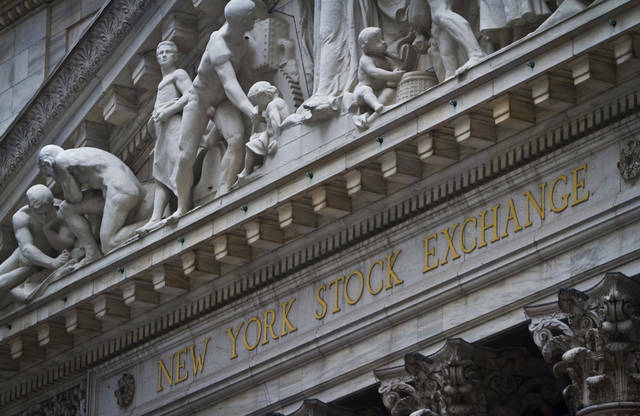 NEW YORK (AP) — Hefty gains for energy and technology companies helped U.S. stocks set more records Monday. Drugmakers announced two major deals worth about $20 billion and smaller-company stocks climbed after the Senate reached a short-term deal to end the government shutdown. Stocks were slightly higher in the early going as strong fourth-quarter results from Halliburton helped energy companies, and big technology companies like Alphabet and Microsoft continued their ascent. Starting at noon, after Senate Democrats said they would support a three-week government funding bill, bond yields increased and smaller-companies shook off their early losses to turn higher. French drugmaker Sanofi is buying hemophilia treatment maker Bioverativ in a deal the companies valued at $11.6 billion, while Celgene will buy cancer treatment maker Juno Therapeutics for $9 billion. In the financial sector, insurer AIG is buying Validus, a provider of reinsurance, primary insurance, and asset management services, for $5.56 billion. Marina Severinovsky, an investment strategist at Schroders, said health care companies are likely to find more money for deals because the Republican-backed tax package gave the companies a one-time tax break on money they’ve been keeping overseas. Meanwhile AIG’s big purchase is a sign of how far the company has come since the federal government bailed it out almost a decade ago. The Standard & Poor’s 500 index picked up 22.67 points, or 0.8 percent, to 2,832.97. The Dow Jones industrial average rose 142.88 points, or 0.5 percent, to 26,214.60. The Nasdaq composite added 71.65 points, or 1 percent, to 7,408.03. The Russell 2000 index of smaller-company stocks gained 7.54 points, or 0.5 percent, to 1,605.17. The Senate was poised to pass a bill that will fund the federal government until early February. That came after Republican leaders said they will soon address immigration and other contentious political issues. The government shut down after the previous funding bill expired Friday. The threat of a shutdown has loomed for months and the short-term fix doesn’t resolve that. But the threat hasn’t troubled Wall Street because investors doubt it would have much effect on the market or the economy unless it persists for several weeks or more. After that, it might affect economic growth or consumer spending. Sanofi is buying hemophilia treatment maker Bioverativ for $105 a share. Bioverativ makes Eloctate and Alprolix, which treat two different types of hemophilia. It’s part of Sanofi’s growing focus on rare diseases, which can command high prices at a time generic medications for more common ailments are falling. Bioverativ jumped $39.68, or 61.9 percent, to $103.79 while Sanofi lost $1.40, or 3.1 percent, to $43.20. Meanwhile Celgene will pay $87 a share, for its partner Juno Therapeutics. Juno is one of several companies developing CAR-T cancer therapies, which genetically engineer patients’ blood cells into “living drugs” that fight cancer. The stock surged last week on reports Celgene might buy the company. On Monday it rose $18.19, or 26.8 percent, to $86 while Celgene added 26 cents to $102.91. Bond prices gave up an early gain. The yield on the 10-year Treasury note remained at 2.66 percent, a three-year high. Halliburton climbed after the oil and gas drilling services company posted a bigger adjusted profit and greater revenue than analysts expected. Its stock advanced $3.39, or 6.4 percent, to $56.40. Competitor Schlumberger, which reported better-than-expected results Friday, gained $3.37, or 4.4 percent, to $79.79. Benchmark U.S. crude rose 25 cents to $63.62 a barrel in New York. Brent crude, used to price international oils, added 42 cents to $69.03 a barrel in London. Insurer AIG is buying Validus, a provider of reinsurance, primary insurance, and asset management services, for $68 a share. Validus gained $20.57, or 44 percent, to $67.29 and AIG slid 55 cents to $61. Utility company FirstEnergy surged after it received a $2.5 billion investment from a group of firms including Paul Singer’s Elliott Management. Those investors will get $1.62 billion in convertible stock and $850 million in common stock, and FirstEnergy said the funds will help the company pack back debt and contribute to its pension fund as it converts to a fully-regulated utility. Its stock climbed $3.05, or 10.4 percent, to $32.45. In other energy trading, wholesale gasoline gained 2 cents to $1.88 a gallon. Heating oil stayed at $2.06 a gallon. Natural gas climbed 4 cents to $3.22 per 1,000 cubic feet. The dollar rose to 110.99 yen from 110.60 yen from 110.98 yen. The euro edged up to $1.2258 from $1.2234. Gold slipped $1.20 to $1,331.90 an ounce. Silver lost 5 cents to $16.99 an ounce. Copper gained 1 cent to $3.20 a pound. The French CAC 40 added 0.3 percent and Germany’s DAX edged up 0.2 percent. In Britain the FTSE 100 lost 0.2 percent. Tokyo’s Nikkei 225 rose less than 0.1 percent and Hong Kong’s Hang Seng advanced 0.4 percent. The Kospi in South Korea lost 0.7 percent.